A few years ago we flew to Penang with the intention of spending three days simply gorging ourselves on traditional Malaysian cuisine. 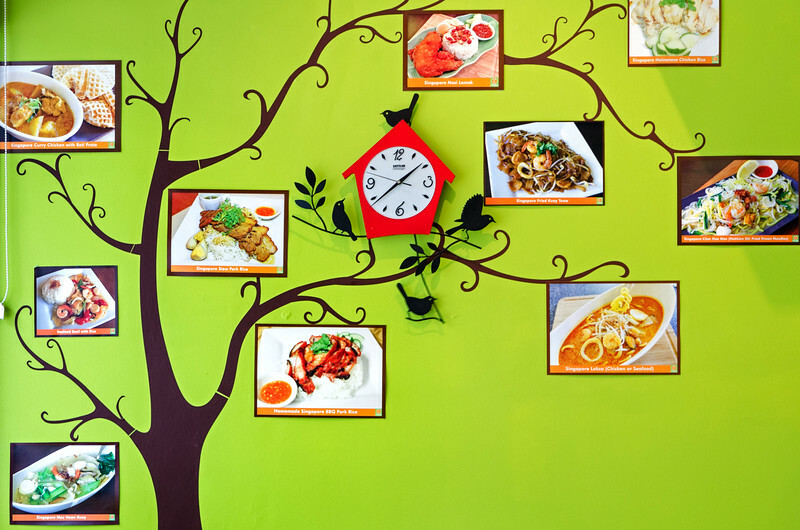 Ikan bakar, rojak, char koay teow, and the queen of them all…nasi lemak! Ever the over achievers, it only took 12 hours for both us to come down with the worst case of food poisoning we’d ever experienced in our lives*!! In between doses of antibiotics** and the odd bowel explosion I did manage to squeeze in a quick meal at one of the local hawker markets for some fried noodles, but by the time our poor digestive systems had recovered to some semblance of normality it was time to move on. All I can say is, thank goodness our flight to Langkawi only took 30 minutes! parched throat announcing its thirst. Thousand gastro-stops to no effect. 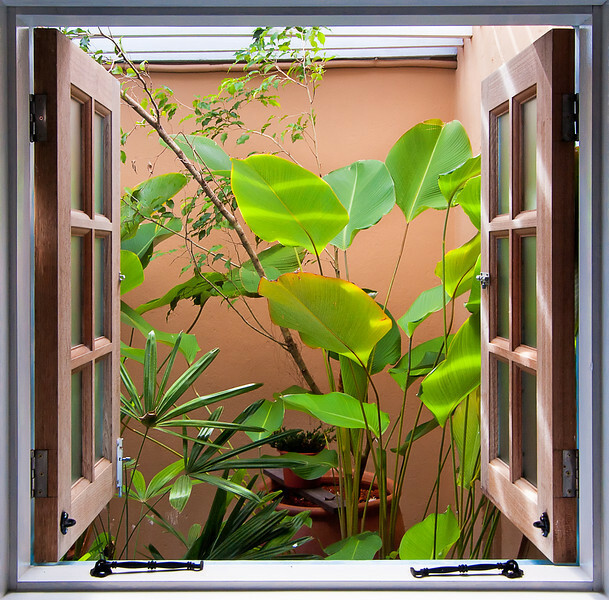 It would be easy to dwell on the negatives, but it does give us a dozen excuses to return! Here I am blabbing on about Malaysian cuisine, when the venue I’m reviewing actually produces Singaporean food. Why? 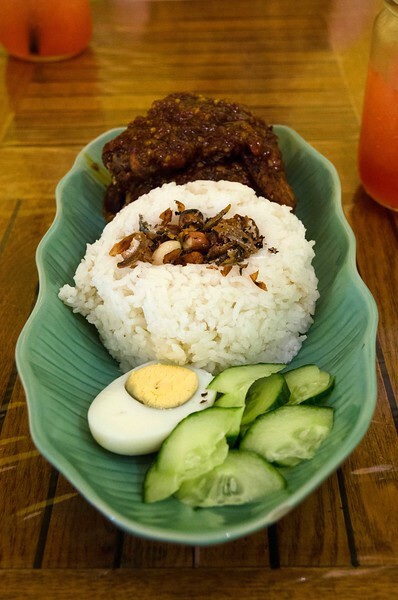 Across Malaysia, Indonesia and Singapore you’ll find many, many very similar dishes such as nasi lemak. While to a local or expert in south east asian cuisine the differences are distinct, my palate isn’t anywhere near sophisticated or educated enough to pick the difference! Despite this deficiency at the micro level, at the macro level both us have eaten enough street food from hawker, wet and night markets across asia to know a quality dish when it stares us in the face. 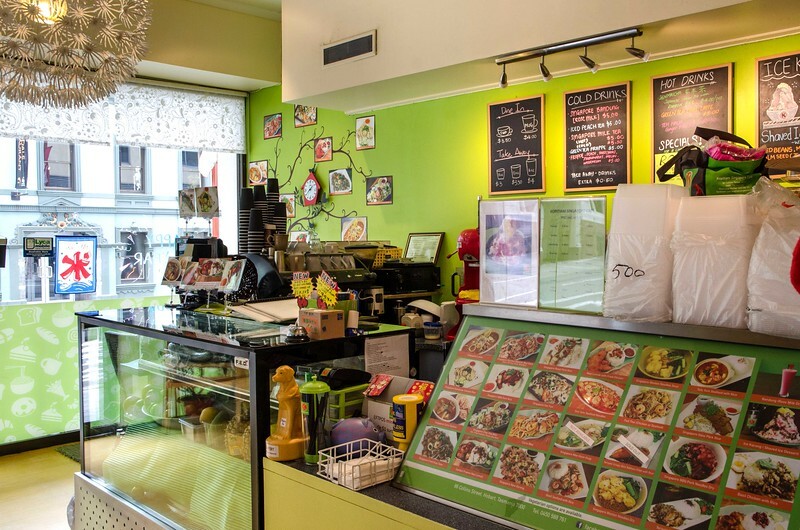 Kopitiam is a Hobart enigma, in the same mould as Rin to an extent. Simple dishes and authentic technique, but in a location (86 Collins Street) that doesn’t lend itself to easy discovery by your average diner. 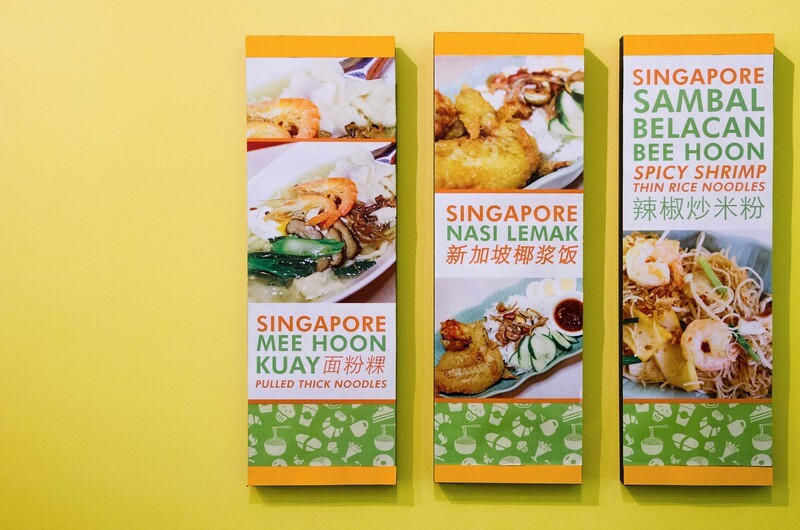 However those who do find themselves taking at seat at one of their plastic-draped tables will be richly rewarded by the vast array of traditional Singaporean dishes on offer. 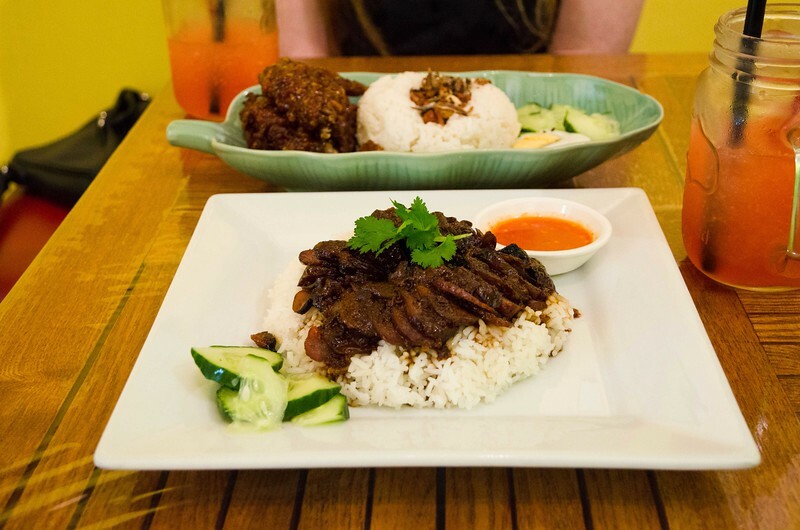 So often in Australia we get a westernised version of asian cuisine, ‘dumbed down’ by the commercial realities of catering to a foreign palate, but at Kopitiam you get the real deal. Karen tried the nasi lemak (of course! ), consisting of rice cooked in coconut milk, meat in spicy sauce (you can choose your level of heat), boiled egg, and the ever-present peanut and ikan bilis (fried anchovy) sprinkled on top. For me it was a simple bbq’d pork in home-made sauce on rice. Both dishes took us back to Singapore/Kuala Lumpur/Ubud, with their fresh ingredients and unique combinations of flavours. 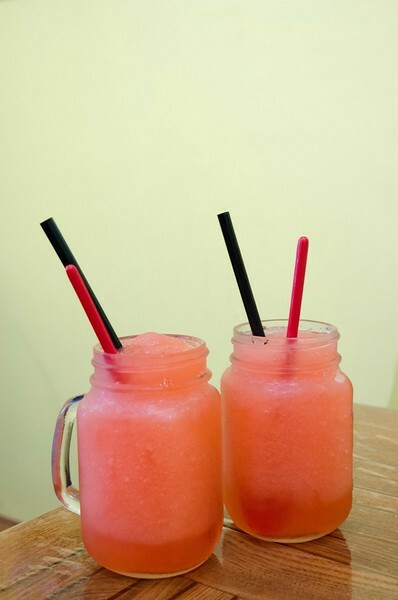 Even better though was the chance to sip on a watermelon ‘shake’ (no milk, just ice) that had us recalling great memories of post-hike beverages in Khao Sok, Thailand. The term ‘hidden gem’ is bandied about with much abandon these days, but with Google and social media at your finger tips it’s rare to find a venue that genuinely fits that description. Clearly Kopitiam is known to many, else they wouldn’t have survived so long in such a niche market (for Hobart anyway), but outside that niche I really do feel that they fly under the radar of most Tasmanians. 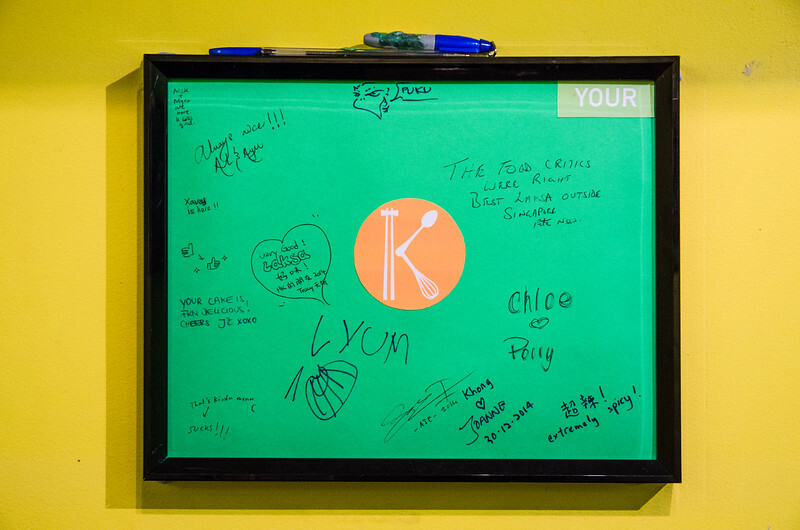 The food is as close as you’ll get to experiencing Singapore without hopping on a big jet plane, and the crew at Kopitiam do it with both passion and skill! It’s a great menu on offer, and I’m really keen to go back and try their renowned Singapore laksa with an ice-kachang to finish for dessert!! When you’re done, you’ve even got the opportunity to provide your own commentary on the numerous feedback boards hanging on the walls! 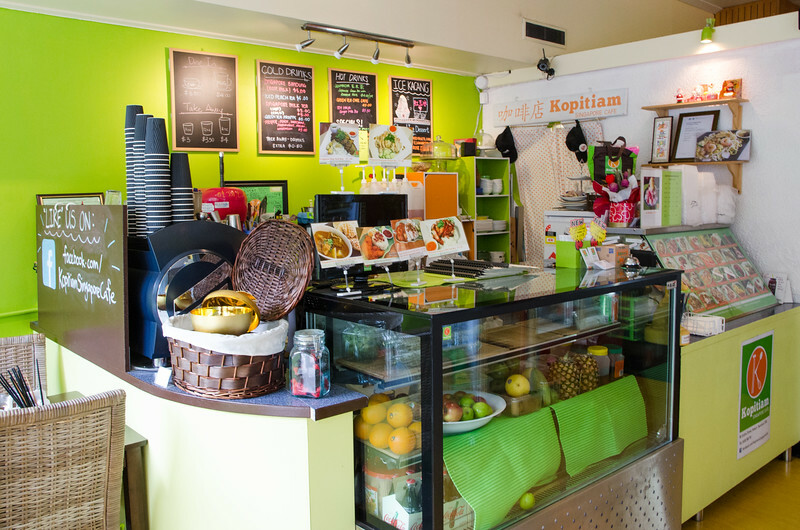 Step through the doors of Kopitiam Singapore Cafe and take a journey down the culinary road less travelled! * Rookie error. You think we would have learnt by now. No matter how fresh it looks, don’t eat the pre-cut and packaged fruit! ** Follow the instructions. Stopping halfway through the course of tablets because you think you’re cured just means more time on the porcelain throne! Ahh Penang Tune hotel & new world park. Some very nice meals there (including chicken satay) but thankfully no gastro. Kopitiam is just up the road from my office, i think i like it being a hidden gem, less waiting for a seat! Exactly right Marc, and here I am telling everyone all about it! That Tune hotel was pretty funny. One night only thank goodness, as we had a very late flight arrival. The rest of our time their was spent at Mango Tree Place, an incredible little bed and breakfast. So glad we were able to look after ourselves there and not at Tune! I have been meaning to try this place, (literally at the bottom of my office building), you have convinced me! How is it possible you haven’t been yet?! 😀 I’m very jealous!! So I just made it to Kopitiam, I am eating Curry Mee as a type….. Brilliant!